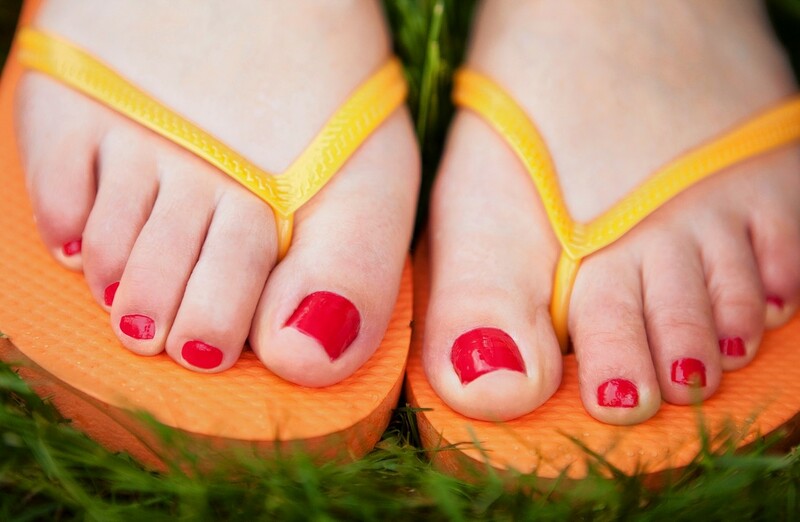 Onychomycosis, or nail fungus, is an infection usually caused by a parasitic fungus nail. Absorbed, yellowed, detached, the nail with onychomycosis requires a specific treatment, rigorously followed for several months. About 10% of the population has onychomycosis, most commonly on the toenail. The point on the causes of onychomycosis, its symptoms and the treatments of this nail fungus, too often neglected. Onychomycosis is most often caused by dermatophytic fungi, more rarely by yeasts or molds. Germs that have in common to love hot and humid places. Fungus mycosis caused by dermatophytes usually follows foot fungus (known as athlete’s foot) contracted on public soil infected with skin fragments deposited by patients. This is particularly the case in swimming pools, saunas, steam rooms, sports locker rooms, medical practices, dance halls. After several months, the untreated athlete’s foot is spread to the nail and cause onychomycosis. Yeasts can also cause onychomycosis in the fingernails. These fungi proliferate under the fingernails of people too often in contact with water. Contamination with mold can occur when contact with contaminated soil occurs. Appearance, much more rarely, of black spots (which require the opinion of a specialist). superinfection by bacteria can cause the appearance of a green pigment giving a moldy appearance to the nail. These same symptoms characterize onychomycosis due to molds. The diagnosis of onychomycosis is based on a mycological examination, a prerequisite for eliminating other nail diseases. Unpleasant without being painful, mycological sampling requires cutting off the frayed nail as far as possible and scraping the powdery debris. If the symptoms of onychomycosis are white spots on the surface of the nail, the doctor will apply to scrape it for analysis. Few laboratories are specialized in the collection and analysis of nails, so the results are relatively long to obtain (about 1 month). Treatments for onychomycosis can combine local treatments with general treatments, depending on the severity and extent of the infection. For light forms of onychomycosis, the application of Lamisil antifugal cream; or a varnish for two to six months is sufficient to overcome onychomycosis. Sometimes the sick nail needs to be removed with a paste applied every day and covered with a bandage. The nail thus treated is disintegrated at the end of the treatment which lasts between two and four weeks; if it is not completely destroyed, the doctor will have to cut it with special pliers. An antifungal cream or a treatment varnish complete this treatment. In case of failure, or for mold onychomycosis, surgical removal of the nail is essential. Advanced forms, on the other hand, require a general treatment. It lasts for two to six months and can be taken orally and can lead to generally mild side effects (digestive disorders, redness), but sometimes more serious (hypersensitivity, rash, blood abnormalities, etc.). Whatever the treatment prescribed, its success is due to its rigorous follow-up, despite its often very long duration. How to prevent recurrence of onychomycosis? Like all fungal infections, onychomycosis is an infection with frequent recurrences. A rigorous hygiene of the feet is indispensable, particularly in people perspiring a lot of extremities. Sports shoes must be reserved for sports and aerated activities regularly. The rest of the time, it’s better to prefer shoes with a leather insole. Cotton socks should also be preferred to synthetic socks, which do not absorb sweat well. In case of excessive perspiration, there are antiperspirants in the form of powder or spray. decontaminate your shoes and slippers with powders or anti-fungal lotions. The appearance of a crack or cut between the toes, a characteristic symptom of athlete’s foot, is an alarm signal of onychomycosis. by less frequent washing of the hands. PREVIOUS POST Previous post: How to remove wisdom teeth in U.S.